Urban Sanctuary Beauty and www.mytattooremoval.com.au now bring your the best is Q-Switched Laser Tattoo Removal! 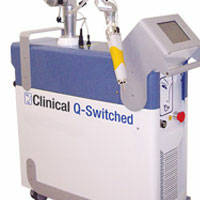 An exclusive characteristic of the Clinical Q-Switched laser is the square and flat top laser beam. This offers safer, more effective treatments with no scars. As the energy is delivered in all of the spot area, it allows for precise covering of the treatment area in a square shaped laser spot which avoids overlapping of pulses which you get with circular spots. We place the spot side by side, which offers total coverage and even energy distribution and no hot spots. Comparatively, the circular spot which not only must be overlapped to cover total areas, but also contains a hot spot in the middle of the spot which can cause undesired side affects such as burns, keloids and scars. If you have a tattoo that you want to remove (in whole or part), please contact the salon on 07 3397 5153 and organise a consultation so we can assess your individual needs.